Homemade peanut butter cookies made from scratch – these are the best peanut butter cookies I have ever made. I remember the first time I had peanut butter. I was in my early 20s and I knew this American girl, who’s name I don’t remember, who was working in my town. We went to her place once and she happened to have a jar of peanut butter in the fridge, brought from home, as things like peanut butter were totally unavailable in Romania then. I was so curious, because I knew about those peanut butter and jelly sandwiches one keeps seeing in American movies and series (last time I saw that: yesterday evening in a episode of Elementary), but I could not even imagine how that would taste. 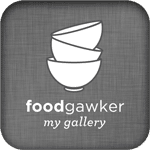 More than 10 years later, time in which I did not give peanut butter a second thought, I kept stumbling upon dozens of recipes using peanut butter: peanut butter cookies, peanut butter cheesecake, peanut butter noodles and so on. I thought, when so many people love this peanut butter so much, it really cannot be that bad, maybe I should give it another try. One thing I noticed in many of the recipes I was reading was that many people mentioned the pure peanut butter, the unsweetened kind, so I was relieved that nobody was considering cooking peanut butter chicken with sweet peanut butter. I wanted to buy a jar of pure peanut butter in the supermarket, but to tell you the truth, I was shocked by its price. While a huge jar of sweetened peanut butter costs less than 2 Euros, a tiny jar of pure peanut butter costs about 5 Euros. Way too little and way too expensive to start cooking or baking with it! So, I have made my own peanut butter and never looked back. I absolutely adore peanut butter now, the pure homemade peanut butter, which contains no sugar at all, just a little salt. I love that pure on bread or with jelly/ jam on top or with banana slices and honey. I love to cook with it, to bake with it, I love to put it in smoothies and ice cream and so on. 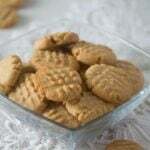 And I especially love simple peanut butter cookies. These peanut butter cookies from scratch are the best peanut butter cookies I have made up until now. 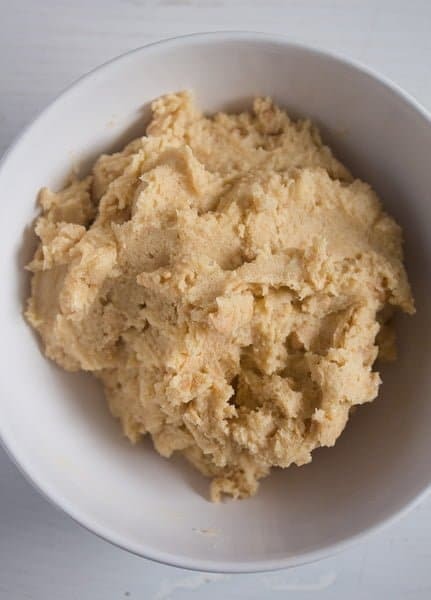 I have tried at least 5 or 6 different versions over the years and we loved them all (my husband is a huge fan of homemade peanut butter cookies), but this version has always been our favorite, I keep going back to it. 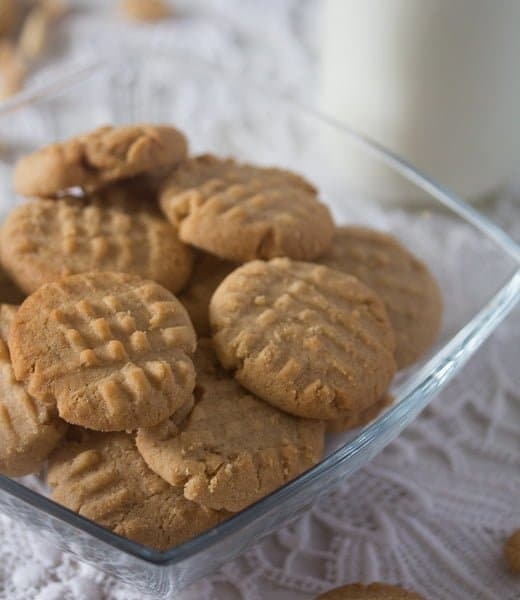 The recipe for these simple peanut butter cookies is easy to put together, contains just a few ingredients, it can be very cheap if you make your own peanut butter or if pure peanut butter is less expensive in your part of the world. Most important of all: the peanut butter itself. Make absolutely sure you use pure unsweetened peanut butter. The cookies are sweet as they are, so I cannot even imagine how sweet they would be if you used the sweetened peanut butter. 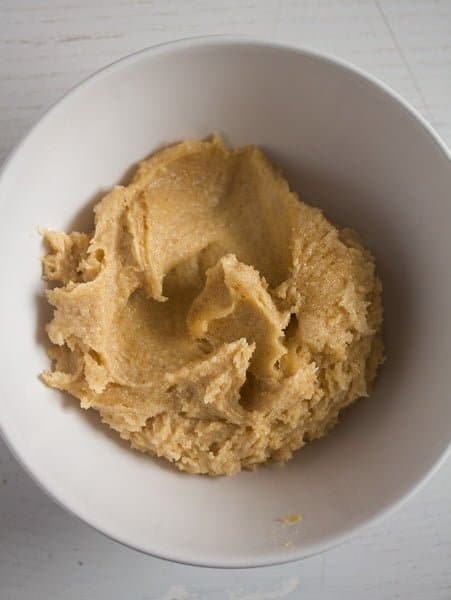 If you want to make your own peanut butter, have a look at this recipe, I have posted years ago. All you need is a bag of peanuts and a good food processor. I’ve made these peanut butter cookies from scratch using both white granulated sugar and brown sugar. You could take white sugar, if that is all you have, but I have to admit that the brown sugar version is better. 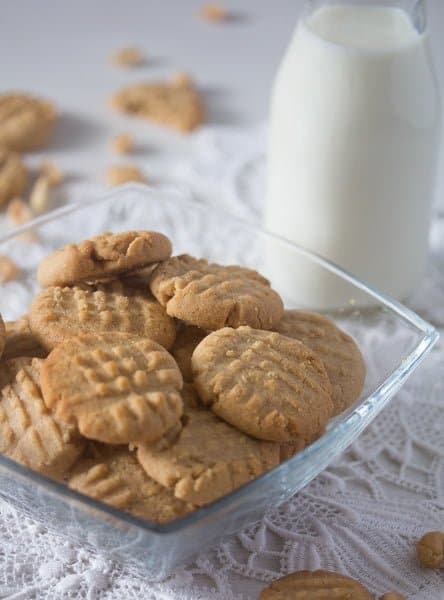 I always add some chopped roasted peanuts to these homemade peanut butter cookies. That was not part of the original recipe (which I found in an old cheap cookbook I bought when we used to live in London), but I added them from the first time and they are wonderful. I once replaced them with chocolate chips, which was great as well, you should try that version if you are a chocolate person. However, I like peanuts more than chocolate, so I stick to the peanuts nowadays. I save the chocolate chips for some really good American chocolate chip cookies. Step 1: Mix together the flour, baking soda and salt. Set aside. Step 2: Cream the butter and the sugar together. Butter creamed with brown sugar never gets that nice and fluffy as the one creamed with white sugar, the brown sugar is not fine enough. But insist and beat the mixture for at least 3 or 4 minutes with a hand-held mixer (or a stand mixer). Step 3: Add the egg and the vanilla essence and mix well. Step 4: Beat in the pure peanut butter. Fold in the chopped peanuts. Step 5: Stir in the flour mixture. Wrap the dough in cling film/plastic wrap and refrigerate for about 30 minutes or until it feels firmer. Step 6: Take out rounded teaspoonfuls of dough and form balls. Use a fork to press the criss cross pattern on the cookies and to flatten them slightly. Step 7: Bake the cookies for about 12-13 minutes or until only lightly colored. Let set on the trays for about 10 minutes, transfer to wire racks to cool completely. 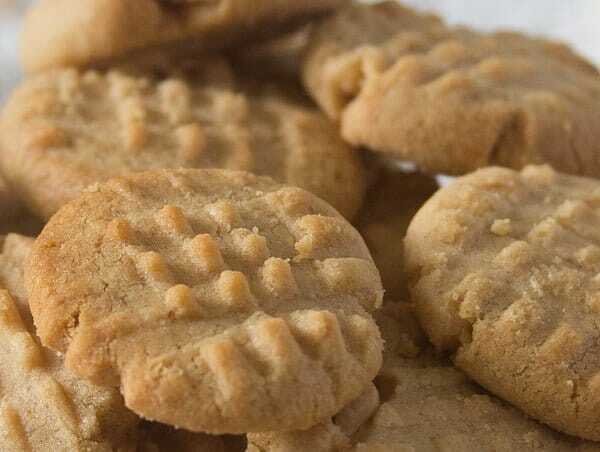 Once these simple peanut butter cookies are cool, keep them in airtight containers. Mix together the flour, baking soda and salt. Set aside. In another bowl mix together the butter and brown sugar until fluffy. Beat the egg and the vanilla into the butter mixture. Stir in the peanut butter and the chopped roasted peanuts. Stir in the flour mixture. Wrap the dough in cling film/ plastic wrap and refrigerate for 30 minutes. Preheat the oven to 180 degrees Celsius/ 350 degrees Fahrenheit (fan oven 160 degrees Celsius/ 320 degrees Fahrenheit). Line two baking sheets with baking paper. Take out rounded teaspoonfuls of dough and form balls. Use a fork to press the criss cross pattern on the cookies and to flatten them slightly. If using a fan/convection oven you can bake both cookie trays at once, if using a regular oven bake the cookie trays one after another. Bake for about 13 minutes or until only lightly colored. Let rest on the trays for about 10 minutes, transfer to wire racks to cool completely. Keep in airtight containers. Haha!I can relate to your peanut butter story. The first time I ever had cereal, I thought it was the worst thing I have ever had (next to Chinese medicine). In Vietnam when I was a child, we didn’t drink milk. So when I was served plain corn flakes and milk, I thought it was tasteless, mushy, and gross. These cookies look delicious!! I love that you use pure, natural ingredients. They do make a difference in the quality of the cookies. 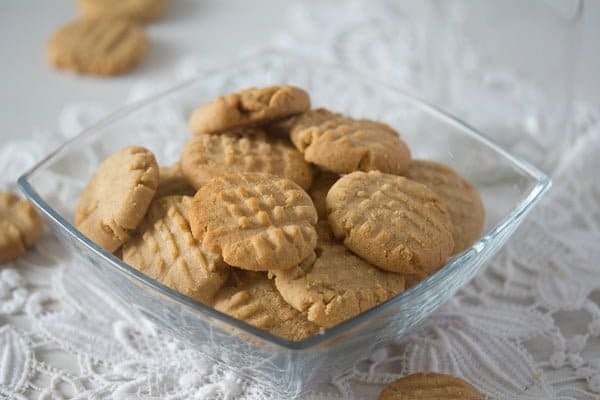 I have never tried baking peanut butter cookies but yours look so delicious that I may just have to try baking some soon.